Wanda L. Spence, a native Washingtonian born in 1957, is known for her rich style, ranging from the figurative to abstract with colorful compositions inspired by nature, shapes, and colors. Spence’s inspiration, which started at a young age, comes from her travels to Martha’s Vineyard and her lifetime perspective of the world around her. Spence developed her visual talent at The University of the District of Columbia, as well as local and regional artist workshops. Spence attended Strayer Business College receiving a Diploma in Computer Programming. She went on to obtain a Bachelor’s Degree in Business Administration from Averett College and Masters Degree in Project Management /Entrepreneurship from George Washington University. Spence has exhibited artwork at the University of the District of Columbia; The Hard Rock Café in Washington DC and art work on the cover of “The Birthing Is In Your Belly” sold at www.TheBookPatch.com. During February 2016, through a juried process, her art was selected and displayed at the DC Pepco Gallery in Carnaval - Celebrations of the African Diaspora. Her art was also selected and shown at the US Embassy, Italy in Transcending Boundaries and presented a Certificate of Appreciation from John R. Phillips, the Ambassador for the Embassy of the United States of America, Rome, Italy. Delilah W. Pierce, Spence’s great aunt, discovered her artistic ability while on holiday at Martha’s Vineyard Island – A place Spence’s family has vacationed for 5 generations. Mrs. Pierce encouraged her to paint what you see - words that resonated as Spence got older. Spence painted murals on Washington, DC office building’s as a young aspiring artist and won many artist competitions. As an artist and business professional, Spence launched LUWAN Creations in 2012 – a handcrafted greeting card company. She has taught the youth of her church, in Arts and Crafts classes, also while on mission’s trips in St. Ann, Jamaica. Her entrepreneurial spirit comes from family lineage, education, and a combined 25 plus years of experience in the creative arts and business industries. Spence also manages the Pierce / Spence Art Collection, established in 1999, to primarily honor the life and legacy of Delilah W. Pierce. Spence manages the sale and acquisition of artwork with organizations namely the District of Columbia Government, University of Maryland University College, Smithsonian Institute and The Kinsey Collection of California, as well as private art collectors. Spence joined Art Impact USA in 2015, a local Arts and Humanities group in the Washington DC Metropolitan area. The group has a membership of over 2400 artists around the globe with a primary focus to create opportunities for artists by converging art throughout the cultures both nationally and internationally. 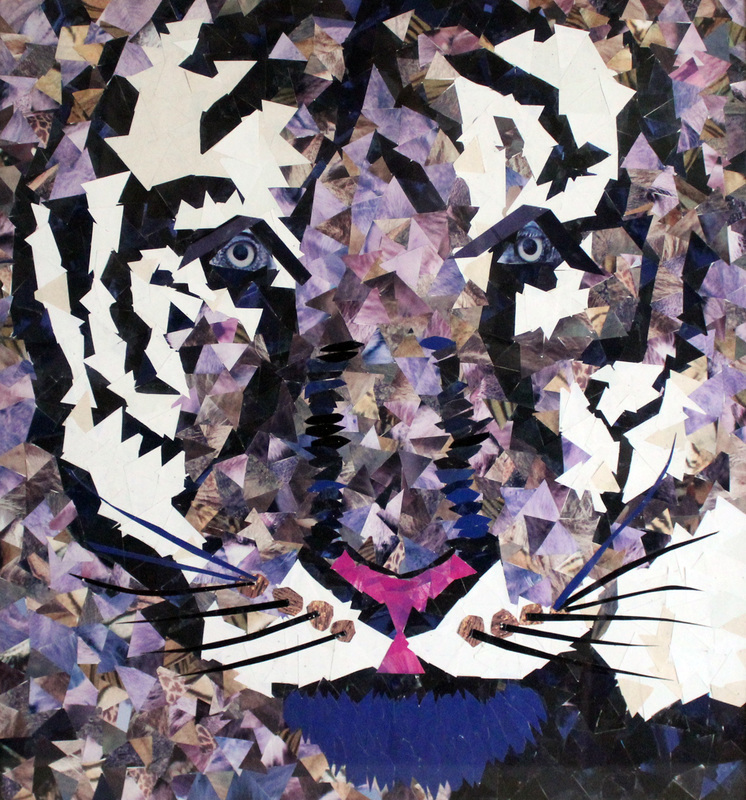 "The Tiger Montage created by Spence with the use of scrap paper and cut up magazines. Designed in a variety of shapes and colors. Any child would love to cut up different types of paper media and design their favorite character."